Abaya is a cloak (i.e) loose garment usually in Black colour is a part of Muslim women’s culture. It is more popular in Middle East Countries (UAE, Saudi Arabia, Turkey, Iraq, Egypt, Qatar, Syria and other countries). The background of an Abaya is to prevent unwanted attention towards their beauty and charms. In recent times, Women’s started begun to wear abayas in varieties of colours that includes grey, blue, green and other dark shades. Most commonly fabrics used for abaya includes chiffon, crepe, silk, satin and georgette. Previously, abayas were looked at a old-fashioned piece of clothing but now abaya has become a fashion statement. They started to wear for every occasions. Why because, numerous designers influences in the population. All kind of abaya styles are available in the market. But, in the current technology people started customizing their abayas on their own fabric style, colour combination and other sequin-works according to their needs with the help of online customizing tailoring store. “Why tailors started their online abaya customizing store”? In the middle east countries, the demands are getting high for abhaya collections. Even though collections are available in physical store. People will not consider only designs but also colour matches, lace works etc. Whereas in online, it provides wide range of styles and designs to satisfy people requirements. By starting this online abaya customizing store, tailors are getting high revenue so it takes their online tailoring business to the next level. So, do you want to start your online abaya customizing store? Then you should need the right abaya customizing software tool. 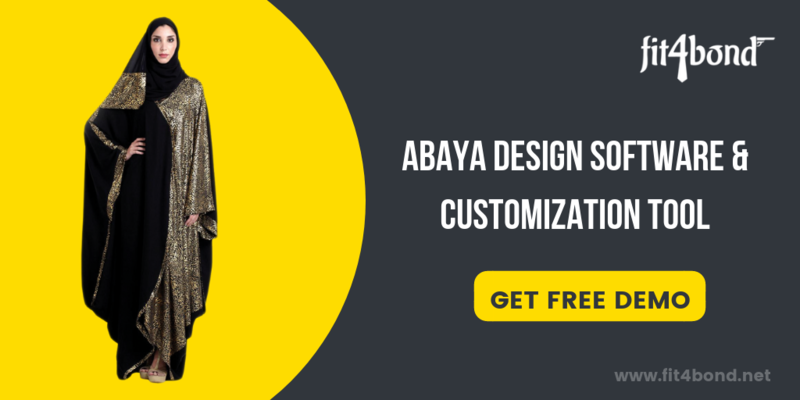 What is abaya customizing software tool? The abaya software tool adds styles and designs. By integrating 3D showcase they can view their finished products & more. By adding these hot plug-ins features to your abaya customizing store will give high growth to your tailoring business. How to get this kind of customizing software tool? Most of the online stores provides this customizing software but we don’t know how it’s worthy? So before you choose just analysed all kind of tailoring based business features available or not and ask them for free demonstration or talk to their experts and clarify your all kind of doubts regarding your tailoring based business queries. Fit4bond is the award winning & leading custom tailoring software provider in India. We provides complete solution for your custom tailoring business depends on your needs. Specially our Abaya customizing software that change technology growth of custom tailors. Customer can design their Abaya and accessories by themselves instead of visiting tailors. * Our abaya customizing software tools with complete customization features have attract many customers towards us and it is a main thing that it would tempt even more clients towards us. * We build fully customized and bespoke Abaya designer software tool solution as per tailor business needs. * We provide complete tailoring online store front integrated with Abaya designer software tool. * Complete user manual and training videos. Set yourself apart and boost your business with FIT4BOND tailoring product designer software tools.